Product prices and availability are accurate as of 2019-04-16 16:17:18 UTC and are subject to change. Any price and availability information displayed on http://www.amazon.com/ at the time of purchase will apply to the purchase of this product. 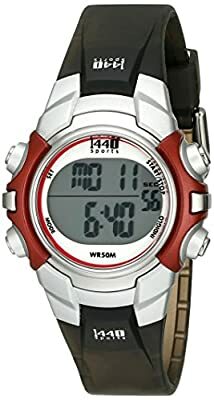 The Timex Unisex T5G841 1440 Sports Digital Silver-Tone/Black Resin Strap Watch offers a crisp, digital dial with a 24-hour chronograph and a daily alarm. The light-weight and durable resin construction make it ideal for your daily running, swimming, or jogging routine. Plus, it offers a two time zone setting that makes traveling easy. An Indiglo night-light features allows you to tell time even in low-light conditions while a strong acrylic window offers protection from scratches and nicks. The watch is equipped with a reliable quartz movement and is water-resistant to 165 feet (50 meters). The 1440 is a feature-laden sports watch ideal for the weekend warrior. With a chromed stainless-steel case and red resin bezel, the watch looks as though it could handle both the long runs on the weekends, and the long barbecues afterward. Features on this sports watch include a timer, dual time zone function, day-date-month calendar, and a black resin quick-drying strap. The watch is water resistant to 165 feet (50 meters).